Westchester County - T.Webber Plumbing, Heating, Air & Electric. Are you a Westchester County, NY resident looking for a reputable home services company you can rely on? 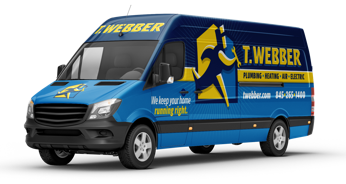 From routine home upgrades to emergency service, you can count on T.Webber to deliver expert plumbing, heating, air conditioning and electrical services. Since 1989, T.Webber has been providing Westchester County homeowners with unparalleled service and value. A+ rated by the BBB, we pride ourselves on our prompt response time, expert technical repairs, and knowledgeable (and friendly!) tradesmen. From Peekskill to Tarrytown, Yorktown Heights to Bedford and everywhere in between– our Westchester County Plumbers, HVAC Technicians and Electricians are available all day, every day to serve your household’s needs. When emergencies strike – you need a reputable company you can count on to deliver prompt, professional service. Whether you have no water, your basement is flooded, your main line is backing up – or your furnace fails on the coldest night of the year, by calling T.Webber you can ensure your issue is resolved with integrity and care. Our licensed and insured Westchester County plumbers, electricians and HVAC technicians are available all day, every day to ensure you have the service you need – when you need it most. For service you can count on – day and night – call T.Webber today.